By using the Buy It Now feature in an eBay auction: You may have already looked at auctions and seen a Buy It Now price located below the minimum or starting bid amount. That little indicator means that if you want the item badly enough, and the Buy It Now price is within your budget, you can end the auction right then and there by buying the item for the stated amount. You can still place a bid on an auction that has a Buy It Now option. When you do, the option to buy disappears, and the item goes into auction mode. If the item has a reserve, the Buy It Now option doesn’t disappear until the bidding surpasses the reserve amount. 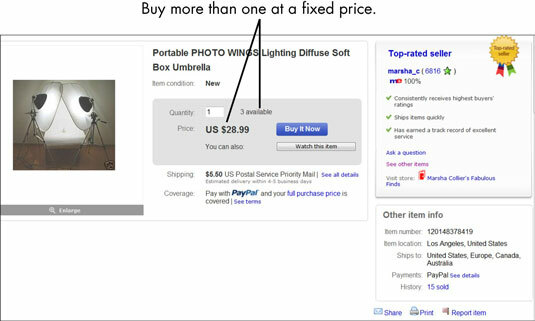 In a fixed-price sale: eBay also offers items for sale without the option to bid. These fixed-price listings may be for a single item or for multiple items. When multiple items are offered, you can buy as many as you like. In one of eBay’s stores: eBay stores are the secret weapon for knowledgeable eBay shoppers because you can consistently find great deals there. Sellers can list items in their eBay stores for even lower fees, passing their savings on to you. You can get to the eBay Stores hub from the eBay home page by clicking the eBay Stores link under the search in the top bar or by typing www.ebaystores.com. 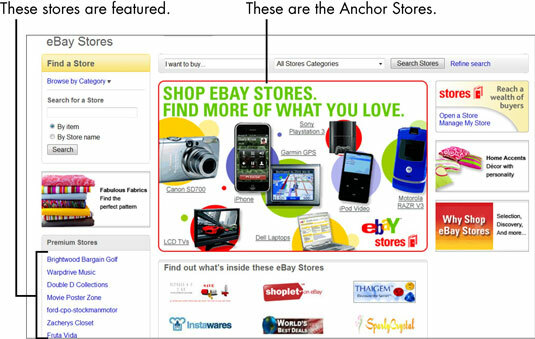 At the center of the eBay Stores hub page, you see a small group of store logos. These logos change every few minutes as eBay rotates its Anchor Stores through the area. Store owners pay a considerable amount to have their stores listed as Anchor Stores. To the left of the store logos is a list of clickable links to stores. These are Premium Stores. You can find more stores, including the smallest ones — the cottage industry sellers — by clicking one of the category links on the left side of the page.